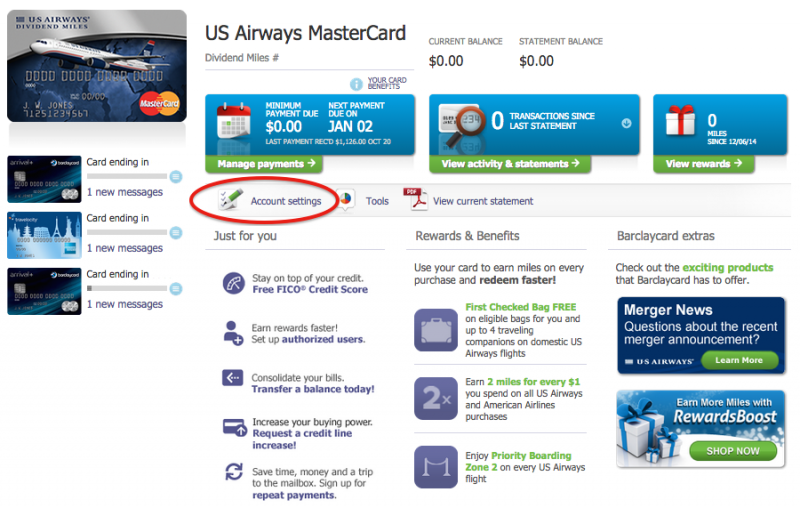 Via Points Centric, Barclays is offering a targeted promotion for it’s US Airways cardholders to switch to paperless statements. If you haven’t previous had your account settings changed to received statement credits you most likely already received the offer when you log in to your Barclays online account. 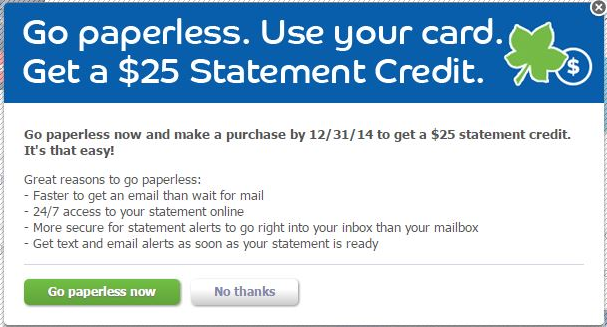 Even if your account is already enrolled in paperless statements you can still get the $25 statement credit by re-enrolling. This was the case with my account so I thought I would try it out and see if I would received the offer. If you have previously enrolled your US Airways card in paperless statements you should still be able to receive the $25 statement credit offer. I tested this method out and it worked for me and only took a few minutes. Definitely the easiest $25 I have ever made and there is really no reason not to do it. First you need to log in to your Barclays online account. From your account home page click on your US Airways card to view your account. 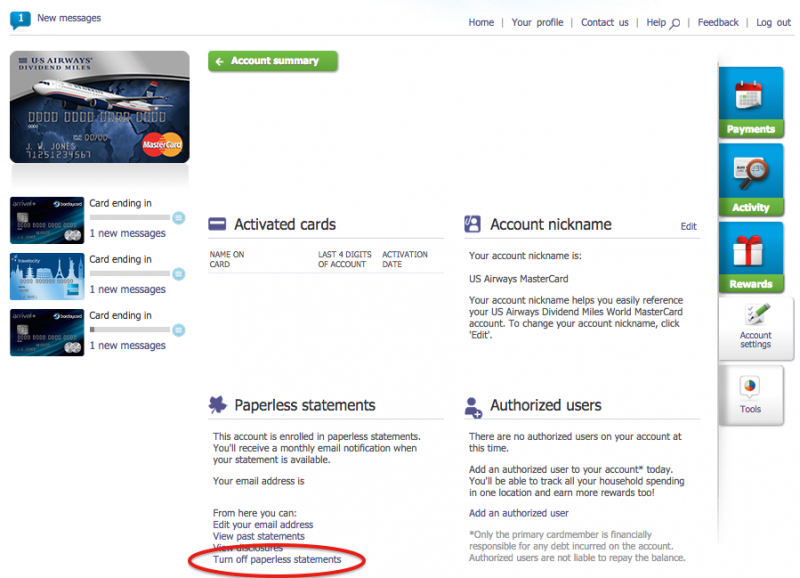 Next, click on “Account Settings” below the “Manage payments” tab. On your US Airways card account settings page you will see an option to turn off paperless statements (if you are already enrolled). Click “Turn off paperless statements” and confirm that you want to do so on the next page. After un-enrolling in paperless statements log out of your account. Now when you log back in to your Barclays online account you should receive the pop-up to receive a $25 statement credit for enrolling your US Airways MasterCard in paperless statements and making a single purchase. Right now the US Airways MasterCard is offering 50,000 bonus miles after the first purchase and paying the $89 annual fee. Opting in to receive paperless statements is a super easy way to effectively bring the annual fee down to $64 for the first year. I’m hopeful it will work, but now let’s wait and see! I’ve had this offer pop up on each of my cards in the same online account when I was logged in at different times. Do you think the credit will post in each? It can’t hurt to enroll since it only takes a minute. You’re the first I’ve heard of getting the pop up offer on all of your cards, let us know if it works!